In the previous post, I showed you the first beads I ever made, my color reference beads and pivot tiles, and the many attempts at bracelets that finally led to something wearable. Today I’ll show you a bunch of other things that I worked on in between figuring out the bracelets. We’ll start back in Germany. In January I bought this beautiful yarn in my favorite yarn store, Strickliesel in Kaiserslautern. 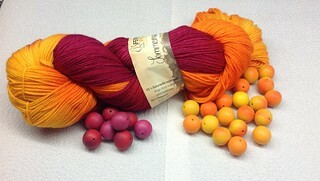 Those amazing colors totally inspired me to make beads for coordinating bracelets. It was a good exercise in using the color reference beads I’d made earlier. Fast forward to March, now in Oklahoma. I ordered some CaBezels, made a basic lace cane, and proceeded to test them together. In the picture above they are not yet cured – they’re sitting on a tile, ready to go in the oven. They turned out quite nice except that the raw white-white cured to an off-white, which was a big disappointment. 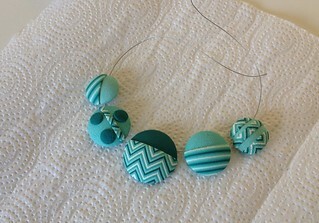 The next project was following Judy Belcher’s graduated lentil bead tutorial. In it, you’re supposed to make multiple canes using the same set of colors so they coordinate nicely. I don’t know if there’s a typo in the tutorial or if it’s just me not used to working with tiny pieces, but I got through making the first couple of canes and then I was out of clay. Hmm. Whatevs. I used what I had and made these beads. I was pretty proud of how they turned out even though they’re not exactly my style. And then I found Polymer School. It’s a Czech program that basically promises to take you from new-to-polymer beginner to proficient jewelry maker. It took a few several emails and phone calls to work out the arrangements and then I was in. And the program is everything they promise and more. I love it. I’m still working my way through it. 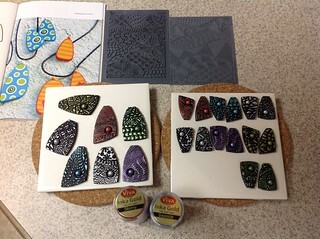 The picture above shows my first pieces, from the free intro video lesson. It was eye-opening for me to actually watch someone work the clay from package to finished, at real-time speed, and narrating every step of the way. 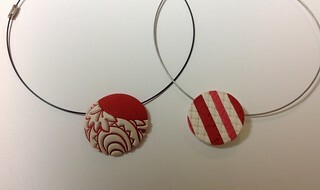 The donut shape is the piece demonstrated in the video; I made the other shapes with leftover cane slices just for fun. This was my first project using Premo and I absolutely loved that the white stayed white after curing. It’s my new favorite. Here I was working with mokume gane – a fun technique that isn’t quite my style but worth learning anyway. I was mostly focused on the cuff bracelet and then used the leftovers to make the pendant and earring pieces and the beads. I’m still not entirely sure what I’m supposed to do with all the cane and veneers that I make, and I always make too much because I worry about not having enough. I think this is one of those things that take practice to figure out. If you’ve ever wondered what happiness in a box looks like, wonder no more for you are looking at it. 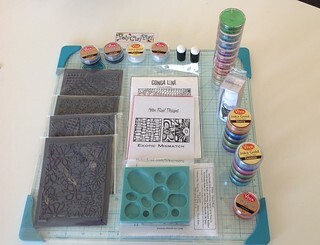 It’s a bunch of fabulous stamps, a silkscreen, a cabochon mold, samplers of metallic paints and glitter, and resin. (Obviously, you’re not seeing these things in the box but on my work tile, but they were in a box when the mailman handed it to me.) They will make for countless hours of joyful creating. This is what it looked like when I started playing with it. 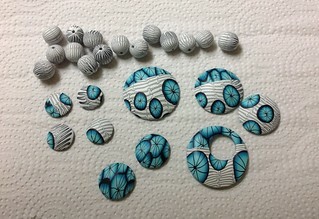 I was inspired by a project in one of my Fimo booklets – you can see the original in the upper left-hand corner. Around this same time I sewed up a white skirt and two red tops, and I was looking to make some jewelry to wear with them. I didn’t have anything specific in mind; I was just playing and looking at what happens when I cut sheets of polymer and put them back together differently (kind of like quilting, but not exactly). 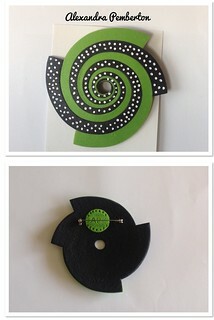 And when I got something I liked, I cut a circle out of it. Or several circles whenever there was enough for more than one. 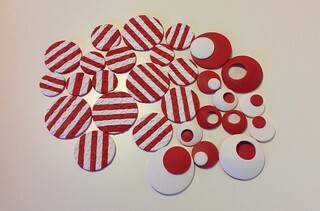 A couple of days later, I woke up with a cool idea I was itching to try: red and white, circles, flat and domed, just play and see what happens. Well, what happened was that when I sat down to work, my muse had a different idea and I ended up combining yellow, white, and black to make the pieces above. Apparently, I needed to get that out of my system before I could go back to the originally-intended red and white. This stuff. 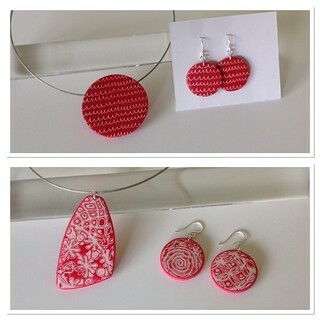 Red and white circles. Different sizes, some flat, some domed, not sure where I’m going with it. I have a sense that was just the beginning. 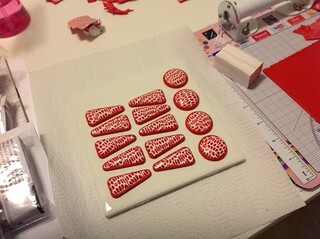 Another project was testing Fimo Professional. I’m not sure if it’s just repackaged Fimo Classic or if they changed anything about the formula. I made color reference beads – gradients around the color wheel, and then just played with black and white. I thought the fuzzy effect was really neat. I found this brand rather crumbly but the colors are beautiful and the clay handles well. After a week of testing the Fimo and some interesting ideas that mostly didn’t pan out, I needed a break so it was back to Premo and simple things. I made two sets of jewelry just in time to wear on a mini-vacation over Memorial Day weekend. They are fun to wear. The top set is silkcreened and the bottom set is made with a technique called hidden magic. Next came this fun cane in black, white, and one color (Peacock Pearl in this case). Someone had posted a picture in one of my clay groups with a link to the YouTube video tutorial, I watched it and decided to give it a try. Making canes takes a lot of practice. Mine are still far from great but I thought this one turned quite pretty anyway. Also, notice I finally figured out how to put my name on pictures (yay!). I think I’ll be doing that from now on. 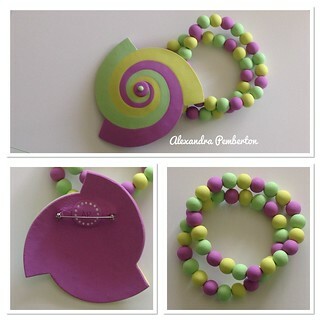 This brooch is my take on one of the assignments in Polymer School. The color combination and dots idea came to me one night as I was going to sleep on our beach mini-vacation. I hope the green looks vivid on your screen – it really is in real life. It is such a happy brooch. It makes me smile every time I see it. Well, a picture of it these days because when my in-laws were visiting last week, my mother-in-law claimed it as soon as she set eyes on it. I was so tickled that she liked it that much. She walked away with two brooches because I made her this one to go with her new wardrobe additions. She picked the colors and sat and chatted with me while I worked. It was fun to have company and also to be able to show her the possibilities and have her make choices on the spot. The coordinating bracelets are strung on an elastic cord to make them easy to put on and take off. And that brings us to a close today. I have some fabrics washed and ready to cut and a knitting WIP that I’ll be sharing next time. 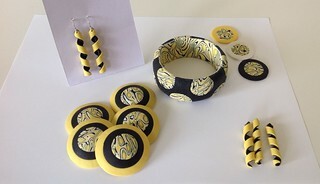 This entry was posted in polymer clay. Bookmark the permalink. I like your polymer jewelry very much. 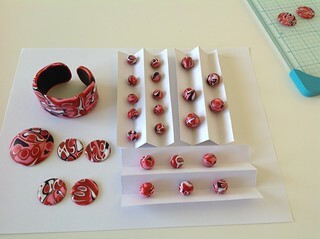 You mentioned the Czech polymer clay program. I looked at your link but couldn’t read any of the details. How much does it cost and do they have an English version? Thank you, Cherry! I know an English version is in the works but I don’t have any timeline or pricing details. OH MY GOODNESS are you ever off and running. Beautiful work. I’m interested in the English version of the workshop when it comes out as well. Fabulous. 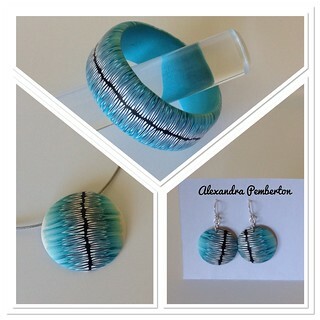 It’s great that you can sew and knit and then make jewellery to match. Looking forward to reading more of your adventures — whether in polymer clay, sewing, or knitting!